For a New Liberty. The libertarian manifesto. New York: Macmillan, 1978. Disciple de Mises et de l’école autrichienne, Rothbard défend une théorie des droits naturels à l’encontre de l’utilitarisme de son maître. Il soutient que le seul État qui pourrait être cohérent avec la morale objective des droits naturels est un État inexistant. Rothbard défend la thèse que le marché est capable, par l’intermédiaire d’entrepreneurs, de prendre en charge la production de sécurité. 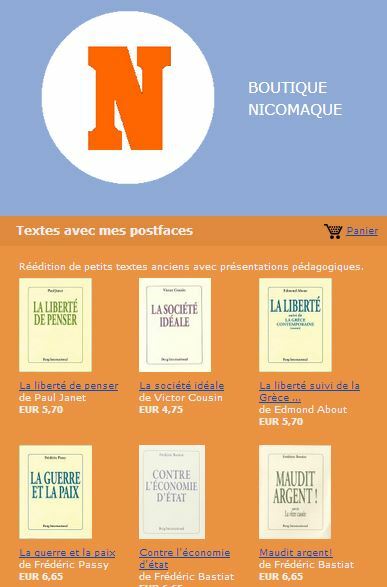 Outre que cette pensée crée une réelle rupture avec la justification traditionnelle de l’intervention de l’État, disposant selon la vulgate wéberienne, du « monopole de la violence légitime », Rothbard souligne que le fonctionnement du marché sur ce type de marché ne diffère pas de celui des autres. En cela, il n’existe plus d’espace d’intervention légitime pour l’État. Il applique également une analyse libertarienne vigoureuse sur un large éventail de questions comme l’éducation ou l’écologie. Il restait à démontrer que le laissez-faire capitaliste est conforme à la justice : c’est ce que fait Rothbard dans L’Éthique de la liberté. Il y montre que la seule définition cohérente de la justice est la propriété naturelle, la libre disposition reconnue comme juste de toute possession qu’on n’a pas volée, c’est-à-dire prise à un autre sans son consentement. L’Éthique de la liberté décline les conséquences de cette définition, reprenant de nombreuses solutions de la tradition juridique et en contestant d’autres. We have talked at length of individual rights; but what, it may be asked, of the « rights of society »? Don’t they supersede the rights of the mere individual? The libertarian, however, is an individualist; he believes that one of the prime errors in social theory is to treat « society » as if it were an actually existing entity. « Society » is sometimes treated as a superior or quasi-divine figure with overriding « rights » of its own; at other times as an existing evil which can be blamed for all the ills of the world. The individualist holds that only individuals exist, think, feel, choose, and act; and that « society » is not a living entity but simply a label for a set of interacting individuals. Treating society as a thing that chooses and acts, then, serves to obscure the real forces at work. If, in a small community, ten people band together to rob and expropriate three others then this is clearly and evidently a case of a group of individuals acting in concert against another group. In this situation, if the ten people presumed to refer to themselves as « society » acting in « its » interest, the rationale would be laughed out of court; even the ten robbers would probably be too shamefaced to use this sort of argu­ment. But let their size increase, and this kind of obfuscation becomes rife and succeeds in duping the public. When one uses the simple monosyllable « France » one thinks of France as a unit, an entity. When . . . we say « France sent her troops to conquer Tunis »—we impute not only unit but personality to the country. The very words conceal the facts and make international relations a glamorous drama in which personal­ized nations are the actors, and all too easily we forget the flesh-and-blood men and women who are the true actors. . . if we had no such word as « France »… then we should more accurately describe the Tunis expedition in some such way as this: « A few of these thirty-eight million persons sent thirty thousand others to conquer Tunis. » This way of putting the fact immediately suggests a question, or rather a series of questions. Who were the « few »? Why did they send the thirty thousand to Tunis? And why did these obey? Empire-building is done not by « nations, » but by men. The problem before us is to discover the men, the active, interested minorities in each nation, who are directly inter­ested in imperialism and then to analyze the reasons why the majorities pay the expense and fight the war necessitated by imperialist expansion. Society is a collective concept and nothing else; it is a convenience for designating a number of people. So, too, is family or crowd or gang, or any other name we give to an agglomeration of persons. Society . . . is not an extra « person »; if the census totals a hundred million, that’s all there are, not one more, for there cannot be any accretion to Society except by procreation. The concept of Society as a metaphysical person falls flat when we observe that Society disappears when the component parts disperse; as in the case of a « ghost town » or of a civilization we learn about by the artifacts they left behind. When the individuals disappear so does the whole. The whole has no separate existence. Using the collective noun with a singular verb leads us into a trap of the imagina­tion; we are prone to personalize the collectivity and to think of it as having a body and a psyche of its own.